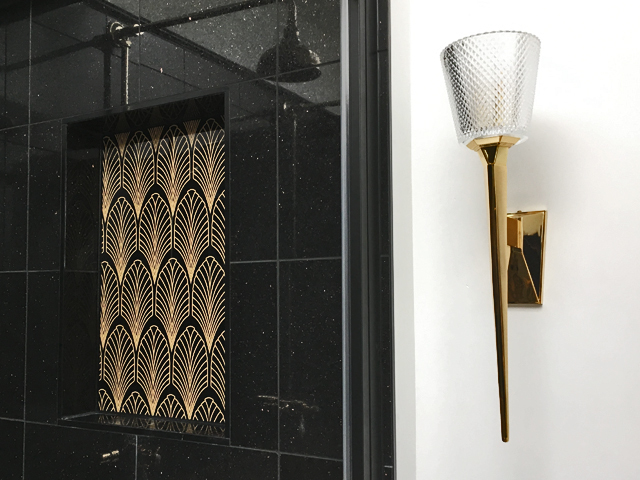 To create an upstairs bathroom in a Grade II listed, 18th Century Manor House in Art Deco style that was bold, glamorous and romantic, with a strong preference for black and gold colouring. 'This project for an 18th century manor house was wonderful to work on. 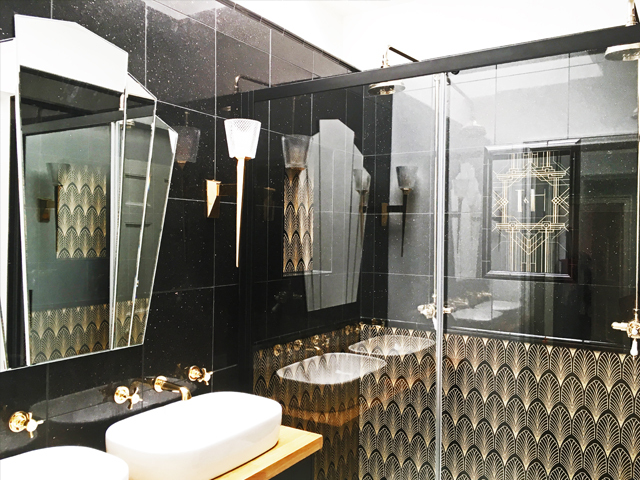 My clients had a very clear idea of the design style they had in mind - a beautiful bespoke Art Deco style bathroom with double showers and basins. 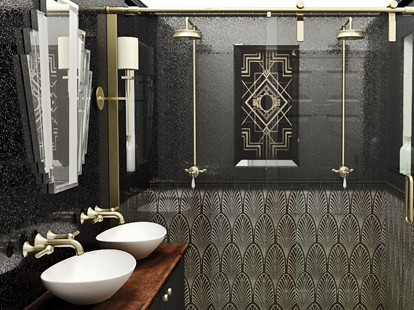 The space needed to be luxurious and sumptuous, with key bespoke detailing to really make it stand out. 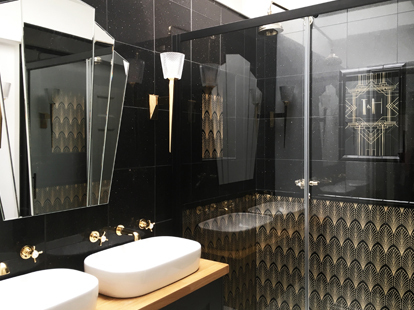 I chose a range of luxurious materials and patterns in the Art Deco style, predominantly focusing on gold and black detailing with additional complementary rich and warm tones of a dark walnut worktop. My design included some key bespoke features including two recess shelf panels in the shower. For these I designed a gold leaf vinyl glass splashback for the two shelf recesses. 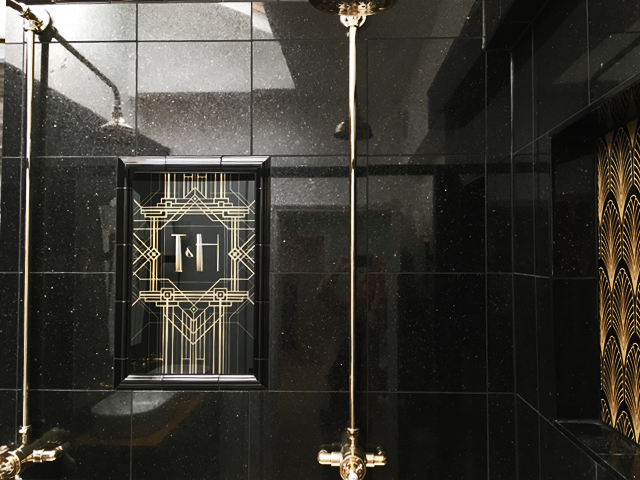 The centerpiece of the shower was a bespoke design Gatsby Monogram with the client’s initials, also printed onto vinyl on a glass splashback. 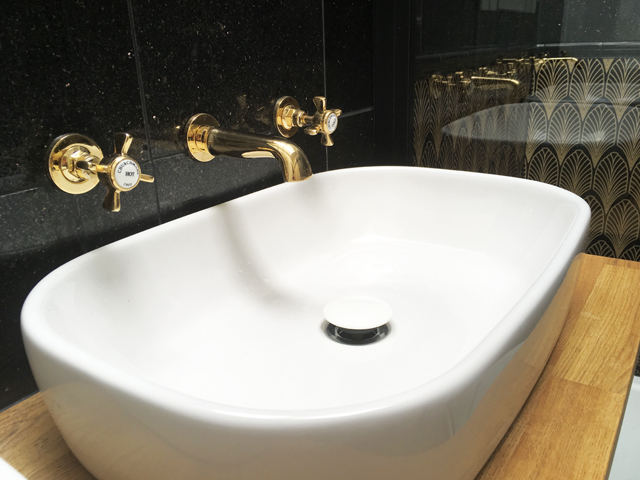 Gold bathroom furniture really gave the whole room a luxurious effect; gold wall mounted basin taps, and beautiful traditional gold showers stood out against the black galaxy tiles. mirror which worked beautifully as a centerpiece together. 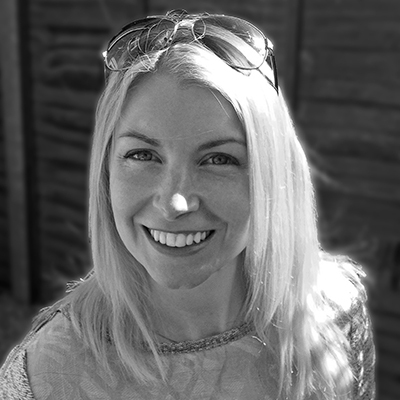 'We are delighted with the service we got from start to finish from Coulby Interiors'.